We're really proud of the reaction we've gotten from our guests in the three years since we opened our new cabin to vacation renters. We knew we had a location that couldn't be matched in all of the Moosehead Lake region, but it was important to us, too, that the accommodations we offered were every bit as much of a pleasant surprise. Judging from the following comments (reproduced from our guestbook), we like to think we got it right! It's been a great long weekend - a girls' trip that had been a long time coming. The weather improved with each day and ended with a great night at the firepit - lots of laughs! We experienced the Appalachian Trail - 8 long miles of it - as well as Borestone Mountain. Enjoyed having each other's company and no distractions like TV or the daily paper. A little slice of heaven! The sound of the roaring Wilson Stream is very soothing. September in Maine .... nothing Better. Family gathering for the fabulous Brown/Pollis wedding. What an enchanting day on the Katahdin (steam ship on Moosehead Lake) and shoreside under the elegant tent. All supported by this lovely home base in the woods. The sound of the falls juxtaposed by the stillness of the woods was a very calming and refreshing experience. A great spot - many thanks! What a beautiful spot here on Big Wilson Stream. The weather has been hot and dry. The streams are all "purring", not roaring. Tubing and fishing have been spotty. The low water and high temperatures have made the fishing difficult and tubing runs very short. Found some great swimming holes. Tobey Falls was perhaps the favorite. Climbed Borestone last Sunday - a fabulous hike, great for the young and 'once young', and not too demanding. Wildlife observations were unusual - no moose, though fox and deer were seen. A pileated woodpecker was heard every day, though not seen. Pileated woodpeckers are large, with red heads, too. Go figure not being able to find it. Biked over to Little Wilson. Nice and short. Hiked to upper falls - a hot day Tuesday, but not too strenuous. Swam at both Lilly Bay State Park and down on Sebec Lake at Peaks-Kenny State Park. A beautiful week, with lots to explore, still, as we never made it to the Gulf Hagas. Enjoy your stay in this beautiful camp. Enjoy the great Maine outdoors, more. It's the morning of departure, and we're sad the week is over. We had a great time! This place is so beautiful, peaceful & fun. We came with friends & our children, ages 9, 10, 11 & 12. They loved the loft area, which they named "the fort". We played games, had campfires, swam & jumped off the rocks, tubed , hiked upper & lower falls, jumped off the rope swing. We hiked to the summit at Borestone, which was breathtaking. We went to Mosquito Mountain & Moxie Falls. Went swimming at Moosehead Lake. Went to the Maine DOT to look for moose a few times, but unfortunately, we didn't see any. We did see a group of deer. That's about it, though. We hiked to the B-52 crash site. There was one rainy day in which some went fishing. We read, and relaxed. Swimming and tubing right here on the stream. The hike up to Little Wilson Falls! Bring swimsuits! Whitewater rafting with Moxie Outdoor Adventures ... a good lunch, fun guides, and of course the adrenaline rush. Ice cream at the Dairy Bar in Greenville. Prong Pond. We spent the day camped on a few big boulders on the right side of the pond ... perfect for jumping! Hiking Borestone at sunrise - highly recommended. Hiking Little Kineo Mt. Getting to the trailhead is tricky, but great views! Spring Creek BBQ in Monson. Yum! Well, to start off, our 17 & 19-year-old sons decided they had better things to do than go on vacation with mom & dad - so we figured maybe this could be a second honeymoon - just us in this lovely home! Our favorite thing to do is hike - and boy, did we hike! 46.5 Miles in one week!! My feet, knees really hurt, but we had a lot of fun , and relaxed. We met several hikers on the Appalachian Trail - both "through" hikers & "100-Mile Wilderness" hikers. They are hungry, so if you can spare a granola bar or juice box, give it to them! Best restaurant -The Black Frog in Greenville. Have to eat on the deck. Thanks for this lovely home - way better than camping! I apologize for my penmanship - so used to a computer that I can't write anymore! Let's start by saying we had a great time here at Big Wilson Camp. Spending time with family hiking, quadding, swimming and just relaxing on the deck at the end of a busy day. We found out that all the people we met here in Maine on our daily adventures were so friendly and went out of their way to make us feel at home. Unfortunately, we had some car trouble on our trip here that needed to be fixed before our ride home. If anyone needs car maintenance while here on vacation, go to Mike's Automotive in Dexter, ME. He was so friendly, very knowledgeable, and accommodating. We hiked Borestone Mountain and from experience, we wouldn't suggest anyone under the age of 10 to make the trek. The final approach to the summit was very steep and not for someone with a fear of heights. Lakeshore restaurant in Dexter was an awesome place to eat - lots of food & yummy, too. Also, not to be mistaken with the first, there is also Lakeshore Pub & Grub, right in Monson - nine miles away - that has great food & hometown hospitality. Wear your bathing suits, too, because you could swim in the lake and slide & trampoline while you waited for food. Kids LOVED it! So much to say, so much to do! All-in-all, GREAT time!. We had a great time here at Big Wilson Camp. We enjoyed the fire pit, views & the house itself. We did enjoy swimming in Lake Onawa & Moosehead Lake. As for Moosehead, we went to two different places: Lily Bay State Park one day, and on another, a few of us took the boat over to Mount Kineo & hiked to Pebble Beach. Both were enjoyable & refreshing. As for hiking, we loved Borestone Mountain, Little Wilson Falls & the Gulf Hagas. Three of us did the Gulf Hagas, because we were originally worried about how long it was, but then we found out you could do shorter loops. Well worth it, and the views were breathtaking. We saw five fox, four moose, too many squirrels & chipmunks and one bat. All & all a fantastic week. Had a wonderful time here at Big Wilson Camp. We hiked up to Borestone Mountain and Big Wilson Falls. We spent one day whitewater rafting on the Kennebec River, which was a lot of fun. In the evenings we would go on our own moose safaris. We saw six moose, five fox, countless deer, and one black bear. We have found the best place to see moose is to drive up to the town of Kokadjo around 9 pm, then drive slow back to Greenville. We spent time in Greenville and found the people to be very nice and warm to out-of-towners. We took the cruise on the Katahdin - well worth the time. What a wonderful place to start our summer! The house and its accommodations were great! We enjoyed tubing in the water and playing around the waterfalls! Our hike to the summit of Borestone Mountain was challenging at some spots, but so well worth it! We enjoyed a day shopping and exploring Greenville - the highlight there being a seaplane ride over Moosehead Lake! An unforgettable trip! Back at the house, we enjoyed campfires with s'mores and songs. While driving the Greenville Road, we saw a black bear, two moose, and countless deer! Very exciting! Drove to the site of the B-52 crash - very moving and amazing. Had dinner at the Lakeshore restaurant and enjoyed overhearing the AT thru-hikers' stories about their travels. One last swim before we leave! We have lots of pictures and memories of our visit to Big Wilson Camp! Thanks! Okay, so we own land & cabins here, but we need Big Wilson Camp for our overflow & dinner party during maple sugaring season. Despite being 'natives', we still marvel at the vistas and enjoy the wealth of adventures available all around us. As we were eating breakfast, three deer came out of the woods in the clearing by the septic / leach field, heading to the river for a drink. Thanks again to Tricia & Eric for sharing this haven with us. I hate to leave. We love reading the entries our guests have left behind, not only to assure that their experiences here fulfilled and surpassed their expectations, but also because many of them find things to do in the north woods that we've somehow managed to miss, despite years and years exploring the place. You'll find in our guestbook the highlights of previous guests' vacations: a young mother experiencing the wonder of Borestone Mountain through her toddler's eyes; a 74-year-ld grandmother managing the hike to Upper Little Wilson Falls; a moose safari; a white water adventure; and many, many more. We confess we're contended to loll around right here at the cabin, taking in the sound of the waterfalls, or take a dip in the swimming hole. Usually. But this time, thanks to a visit by a friend whose idea of fun is a three-day "Death Hike" up as many 4,000-foot peaks as he can climb in a weekend, it was necessary to find an outing or two that would content his wondering feet. We found ourselves twice on the Appalachian Trail - one segment right nearby, running from Upper Little Wilson Falls to the crossing of Big Wilson Stream, then completing the loop back to the old campground at lower Little Wilson Falls. It was a great, six-hour trek, with views of Little Wilson gorge from Wilson Cliffs and varied terrain from a moose bog to a forest caked with thick layers of moss. The day prior, we hiked the rim trail of the Gulf Hagas - Maine's answer to the Grand Canyon. It's something I've meant to do for years, but thought it was a little too far of a drive to make it worth it. Wrong! This is a must see, must do experience. Three magnificent waterfalls on one hike, sheer cliffs. Amazing scenery! Billings Falls and Screw Auger Falls were our favorites. We started on the northwest (upstream) end of the canyon and made it to the southeast end in about four hours, finishing the loop (eight miles) by dusk. It's a whole day commitment. The drive from Greenville is about 30 minutes on gravel roads, but they're in good repair. Our other adventure was a climb up Squaw Mountain (aka Moose Mountain), earlier in the week. We didn't use the marked trails, deciding instead to walk up the ski trails on the other side of the mountain, under the chair lift. What looked from the bottom of the mountain to be a dusting of snow on the top was actually about six inches of October snow. It was a little foolhardy of us to make the climb without much in the way of emergency supplies (don't do this at home, boys & girls), but we made it up & down without major incident (except for a few tailbone bruises). That old ski hill has to have the most outstanding views in New England - Moosehead Lake from end-to-end. Friday: Got here, and were all very excited. Played Apples to Apples (in the closet). We recommend it to a large group. It's great! Saturday: Hiked to Upper Wilson Falls. Also great, but a bit scary. We were so high at some points! Later, we made use of the outdoor firepit and got a good look at the AMAZING night sky. Thanks for having us! This place is great! We plan to come back next year. Plain and simple, take the Moose Safari with Ashley Simpson through Northwood Outfitters, right in Greenville. We chose the evening trip (no 6 am for us!) and were rewarded for that decision. A beautiful clear day gave way to sparkling evening. Ashley is a fabulous guide. We entered the water to discover two glorious loons. Quickly, we came upon a bull moose, watching us with caution, and a cow nervously backing up into the woods. Next, a deer scampered into the water in front of our canoes and swam across the pond. We floated and canoed for an hour or so, then left in the early twilight to see an enormous beaver dam. Next we golfed Mount Kineo. A scrub course with tough greens, but glorious views. The third hole plays up to the cliff-side and the eighth plays into a private group of homes that reflect a bygone era. Just lovely. The guys hiked Borestone Mountain - beautiful, but extremely difficult - right from the start. Sarah and I stayed back and floated in the swimming hole. We took a whitewater rafting trip with Moxie Tours. Beware the 16-Mile road from hell! The rafting was fabulous, but cold. Come prepared! The full day offers a lunch and a few hours of lazy floating. If it isn't warm, just do the exciting upper falls and skip the shivering. We hiked little falls to the top. Fabulous! And enjoyed the rope swing. There is so much to do, I wish we had another week to relax in. Try the Black Frog. Great fun. Auntie M's has terrific breakfast. The Rod 'n Reel was great for seafood and the Lakeside in Monson was good fun and great food. People in Maine are so friendly. Martin found the fishing challenging, but rewarding, with brook trout. Ryan said the seafood pizza at Graves was awesome. Martin enjoyed the Ultimate Burger at Auntie M's. Ryan and Sarah though the fishing on the left of the camp was the domain of the weenie fish, but a confidence builder. Colin enjoyed the hiking and running up ahead of everyone. This is a very special vacation for us as our only son will start his senior year of high school in September. We have been visiting the Moosehead Lake area for years, and brought three 17-year-old boys out to the wilderness to take their senior photos. Yes, we are crazy! Instead of having to travel around for photos, we were able to get most of them down by the stream, and they look great! This week has been lots of fun visiting Mount Kineo, Bar Harbor, Borestone Mountain and the falls, and of course a couple of stops at "Reny's" - Love it!! We've met up with the usual suspects: a bull moose, baby moose, eight deer, two foxes, mink, turkey and, just today, someone's bull got loose and was alongside the road, too! Next year we might be back as "empty nesters". Thank you!! My wife and I had a wonderful stay at Big Wilson Camp. As many previous guests have noted, the tranquil beauty of Borestone Mountain made for a memorable hike. We were just contemplating how we could somehow record the sound of the falls to lull us to sleep back home in NJ. The cabin is so comfortable, too. It's been wet out, mostly, but we enjoyed our nights by the woodstove, with the cool evening breeze gliding gently through the screens. I wanted to share a moose story with future guests. We kept wondering if/when we would see a moose. We made a fishing excursion to Salmon Pond (near Greenville) and while setting up my rig, I heard a loud couple of splashes across the pond. Lo and behold, a large bull accompanied by a female had run into the pond. I ran to the truck to get Adria and we got some great photos & video of these two moose, frolicking less than 50 years away. After awhile, I resumed fishing and Adria went back down the trail to the truck. I thought nothing of the increasingly close proximity of the female moose's "mooing" calls until I looked up and saw her standing about 20 feet away, looking right at me! I don't know much about moose, but the sight of such a large animal, who was completely undeterred by my presence, gave me the idea that my best interests lay about 20 feet off the ground, so I scampered up the nearest pine tree until she went on her way a few minutes later. Quite an exhilarating experience! I only wish I had the camera with me. My wife had taken it with her down the trail. Would've made for some amusing footage! Anyway, the whole trip has been a thrill. We are hooked on Maine and hope to return again soon. Enjoy! What are the lyrics to the "Underdog" theme song? Who was Mighty Mouse's girlfriend? We can wait until we get back to find out. But we'll be back up here soon - a few days is not nearly enough to enjoy this beautiful place. What a beautiful place. My family thoroughly enjoyed this escape from overpopulated New Jersey. The hike to the falls was great - the view exceptional. The B-52 site was humbling. Hope to come back soon. Did not see any moose, but we did encounter a black bear on Eliotsville Road, about four miles from camp. We have had a magical time this week! This is the first family vacation we have taken since our son was born (he's 14-months old) and we have all loved it! We took our kayaks out on Prong Pond and Lake Onawa - both such beautiful places! We hiked every day ... to the lower & upper falls, up Borestone ... Grady happily tucked on my back, would talk to the trees, birds, insects and take naps along the way. My husband and I loved the rope swing. As we dropped in the water, Grady waited to share a smile once we surfaced! We also read stories, books; I knit a dress for a friend who just had a baby; we played dice, sat by the fire, and of course ate delicious s'mores! A perfect place to remember to always take time for yourself! Many thanks. P.S. - We also picked blueberries twice, because Grady went crazy over them! Yummy! Blessed are they who build gorgeous mountain retreats like Big Wilson Camp. It's paradise! My stay was so much more then I could have hoped for. Hiking the waterfalls; rock diving; the swimming hole; the general store; home-made honey; basking at the fire pit - that was just the 1st day! A well-stocked kitchen, complete with quality cookware and utensiles ensured a fine meal. And I was famished!! Thank you, thank you, thank you for thinking of everything. Note: The 1st sunny day, you've got to hike to the top of Borestone Mtn. You will not be disappointed. The views are incredible!! Be sure to push on to the 2nd peak. It's worth it. I will surely return next year! What a blessing this place has been for our family!! Borestone - what a blast (lots of blueberries). What a view. Happy kids. Mt Kineo - More berries. More great views. Happy kids. Playing in the river, catching trout, BBQ on the desk. My wife and I both have very stressful jobs. I became so relaxed, I felt like 'Gumby'. The toughest part will be saying goodbye. We saw while here (red fox - 3 times, racoon, moose - 2 times, a weasel, and two beautiful king fishers). Lilly Bay State Park - just outstanding. The lake is so clear, water so nice. Thank you so very much for the use of your home. May the powers that be bless this place and keep it whole!! Such serenity here, the moon over the falls is a scene to behold. The cabin-house-home is so very comfortable, you feel as if you've been here and belong. We bought fresh eggs from Matthew's Farm, and they welcomed the boys to visit with their beautiful farm animals. 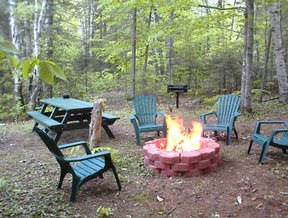 The fire pit brought back so many memories for me, having grown up in Nova Scotia. It's so great to see my children and grandchildren having conversations that were time-worthy, not just passing comments made because everyone's so rushed where we live. We played cards, read, walked, looking for moose, but saw none - not for lack of trying. We drove to Greenville all but one day - my guess is they (the moose) have lots of pictures of us (ha-ha). I'm one who can't go to sleep without T.V.. Well, I had no problem at all. The air is so clean and the sound from the falls is so soothing, you should record it. We owe this beautiful vacation to my oldest daughter, who we thought was crazy, because it was so far away. And that it is, but worth the experience, and unleashed feelings in areas of life. Thanks for a trip down memory lane, peace of mind, and a chance to remember how nice people really are. Guess what? Saw a moose! We were very excited to arrive here after our two-day (12 hours total) trip. We opened the doors and the three boys (8, 7 and 2 1/2) spilled out towards the stream, whooping and hollering! On Sunday, we went into Greenville to set our week with Northwoods Outfitters and do food shopping. We came back and my husband and the two older boys hightailed it to the falls, out back. We ended that day with s'mores. Monday, we hiked up Borestone Mt. The 2 1/2-year-old was a trooper! Whatever the other two were doing, he was going to do! We had lunch at Sunset Pond and watched as Patrick (2 1/2) fell in. That ended the hike up. We took the nature trail down. I thought it was never going to end. Carrying a 43 lb. bundle of love (Patrick) kind of takes the fun out of it. Needless to say, Patrick had a fantastic nap while the others swam. Tuesday, my husband and two oldest went fishing on Lake Hebron. We had more s'mores. Wednesday was our big day! We visited the B-52 crash site and then drove over to Moxie Falls, which is gorgeous! However, the drive was not! Driving 19 miles over logging roads with little gas, not knowing where we were going was a little daunting! We asked at the local gas station if there was an alternate route back to Greenville. If we stayed on the 'tar', it was 75 miles. We took it! We got into Greenville in time for our moose safari by Northwoods Outfitters. We had a great time paddling up to a bull moose. The boys loved it. We beat the storm approaching and quickly got off the pond. Thursday was a down day, but my husband and the boys rented a canoe and went fishing at dusk and Friday morning, Patrick even caught two fish, but wasn't keen on touching them! We ended Friday watching a wooden boat parade on Moosehead Lake. We had a fantastic time all week! We had good food from the BBQ Shack in Monson; we ate on the barge at the Black Frog; we munched at Graves; and feasted at the Rod 'n Reel. Everywhere, people were wonderful. The couple at the BBQ Shack loaded me with info on where to eat and go in Monson and Greenville. The people at the general store were great. We were so relaxed! We loved your place, everyone and everywhere ... and the bugs loved me! Thank you for a wonderful time. We hope to make a return trip soon. Now we prepare for our one-day, 12-hour trip home! P.S. - Just walking down the surrounding dirt roads with the light dappling through the trees, put me in mind of Robert Frost and 'The Road Less Travelled'. Everyone loved the cabin!!! We had such fun jumping off the ledge and the nearby rope swing. Some of us hiked up to the waterfall (Upper Little Wilson Falls). Beautiful! We enjoyed a day at Bar Harbor and Acadia National Park. We also enjoyed just hanging out in Greenville (especially the ice cream). We visited the (B-52) Bomber crash site (on Elephant Mountain) and have never seen anything like it. It was very sobering, yet peaceful. Had a lot of fun exploring swimming areas up and down the creek. There are so many things we didn't have time to do! Hopefully, we'll be back soon to do them. Even the bugs couldn't keep us from enjoying our stay here. All the information at the cabin came in handy. We used the directions and got ideas and tips on other things to do. We got to enjoy a mama fox and three babies just up the road. We also saw quite a few moose near Greenville. Thanks for sharing this beautiful place! The overflow from Honeymoon Maple Works (2 miles west) enjoyed a lavish buffet and overnite. Thanks so much, Tricia and Eric, for letting us stay here. One of these years, I hope it will be for [a longer stay]. I'd love to just sit and read. See you in August, hopefully. Our weekend here has turned out to be a 10! Ideal weather for hiking both days. Foliage at its peak! We chose to hike Borestone through the wooded trail as opposed to the gravel road. The rugged terrain and heavenly man-made steps were remarkable. Viewing the colorful foliage, ponds and lakes from the summit was spectacular! My husband and I made it to the top in one hour, but we hike fast to get our exercise in. The rocks at the top were a bit of a challenge in the "fear of heights" department, but I was humbled when I saw about six or seven 8-year-old girls at the top! (and met an 80-year-old woman nearing the top.) My new-found "slight" fear of heights was confirmed when we walked across the 100'? high tressle bridge (Onawa Tressle)! Had a delicious fresh egg breakfast from eggs up the road. Highly recommended! We are so glad we found such a serene respite. Thank you! We really enjoyed our stay here. Set up for a 3-day stay, and ended up adding an additional day (glad it was open) at the end of our stay. The first three days we spent enjoying hikes and visits to all the surrounding areas, then realized we missed out on just enjoying the cabin, here. Spent the last (extended day) sitting by the fire and relaxing by the falls. Never saw a moose - anywhere! I think they know hunting season starts next week. A small gray fox walked within five feet of us while sitting quietly by the fire ring. There is so much to see and do and so little time. Make sure you make time for yourself to sit, relax and enjoy where you're staying. The cabin is outstanding. The property is even better. We will be back. Thank you for sharing your place with us. This climb is challenging - longer, but not much more difficult than Borestone. The views of Onawa and Borestone are not to be missed! The rockfall from the Slides (a vast field of freight train-sized boulders) are humbling. Amazing what a glacier can do! If you have a little more time, continue on to the peak of Barren Mountain and climb the abandoned forestry service tower. (The top was blown off in a windstorm, but the ladder is still intact, and provides incredible views. Thank you so much for sharing this wonderful place with us! Had a great time despite uncooperative weather some days. The cabin's comfort got us through the rainy spells - many games of Cranium and Apples to Apples. The kids really enjoyed the swimming and tubing - loved the sound of the rushing water always. Had a great day on Moosehead Lake - rented a boat from the Birches, packed a picnic lunch from Juno's, hiked the Bridal Trail on Kineo. Also hiked Little Kineo (long drive but worth it - nice views). Saw a total of five moose, the red foxes, woodpecker, rabbits, chipmonks and lots of other wildlife. The INDIAN STORE (Indian Hill Trading Post in Greenville) WAS COOL! Took a drive (long) and short walk to Moxie Falls. Beautiful. This is a beautiful spot! The swimming hole was fantastic. My daughters and I went down to the river and walked on the rocks and skipped rocks. They were awed by the sound of the rushing water and that you can hear it from the cabin. We drove down to the D.O.T. building and saw five moose just hanging around. That was really something. We also saw a reindeer and some bunnies. We saw a fox on the road in front of the cabin (our oldest spotted it). The cabin is beautiful! Very homey and comfortable. (I'm glad we thought to bring a gate to keep our 2-yr-old off the stairs. Her older sisters though the loft was quite cool and she wanted to follow them up.) You obviously put a lot of time and care into the cabin. It's decorated beautifully. We were celebrating our oldest daughter's 9th birthday on 6/9 and she had a blast. She's already asking when we can come back. Next time we hope to have more time so we can really go exploring and see some of the sights some of the other guests have mentioned. Thank you for having us. We've enjoyed following all these stories about our guests' visits to Big Wilson Camp these past few years. But we've neglected adding our own entries to the guestbook for way too long! I was especially jealous of the Darmos, who visited last July and witnessed a moose sighting right out in front of the camp. Before this visit, I hadn't seen any moose closer than Greenville, but the day before yesterday, my wife and I met a moose cow just on the other side of the Elliotsville Road bridge. I want a picture of one *ON* the bridge or in front of our Big Wilson Camp sign, so I can put it on our web site (www.bigwilsoncamp.com). The fishermen were having a field day here this weekend! A grandfather/grandson fishing off the rocks at the swimming hole across from the camp caught an 18-inch trout (a "brookie"), and two other keepers. Another couple said they'd caught a salmon and a trout. (I'm not a fisherman, but I like to hear the river is healthy and spawning new generations of wildlife. I've been surprised so far Big Wilson Camp hasn't attracted any whitewater kayakers. We do, after all, have splendid class III and IV rapids right out in our back yard, and more downstream in Willimantic. Yesterday, we had two expert kayakers out on the falls, and recorded their antics on video. Look for it on our web site. I hope to post it as soon as we're back home in Iowa. Keep telling us your stories! We post all these entries to our online guestbook (unless you ask us not to) and it really helps convey the message that this is a great place for families to come and connect with nature and each other. Big Wilson Camp (BWC) welcomed the overflow from the Farnham-Davis-Russell-Sprague/Wong cousins' annual maple sugaring weekend at our farm in Elliotsville (2.2 miles back up the Elliotsville Road). BWC is, quite literally, splendor in our backyard. We enjoyed a big family dinner, the kids watched a DVD, and the turkey vultures soared high over the deck - hoping to score a cocktail, no doubt. Our families have all grown too large to fit everyone at the "Honeymoon Sugar Works", so we suspect that BWC will become a yearly tradition for the overflow. Party attendees: Pat, Rollie, Tim, Erin, Cori, Nathan, Karen, Ed, Linnea, Bryan, Andrew, Mea, Kate, Jeff, Tory and Ali. All celebrated Pat's birthday. If you would like to sell me a lot on the river, I could put my cabin here too! Thanks for a wonderful stay. The Bruises Were Worth It! It is our last night here at Big Wilson Camp, and what a marvelous time we have had all week! I am here with my parents and my two younger brothers - Kevin (18) and Nate (14) from the great city of Annapoles. What a completely different atmosphere is is out here compared to Annapolis! We came from people everywhere, traffic, city sounds all over, to a place where the only thing you can hear is the sound of a waterfall right out back - magnificent! When we arrived, the first thing we noticed was how beautiful the property is and how well-furnished and well-kept the house is. The decor is just beautiful and the amenities do make you feel right at home. We didn't waste any time before taking advantage of the tubes that were left for us to enjoy*. Throughout the week, we swam, hiked up to Little Wilson Falls as well as Borestone Mountain. Now, THAT was a hike never to be forgotten. Mom and I couldn't get to the very top because of the height (whew! ), but we hiked up to just beyond the trees where we could see the lake. There is nothing more beautiful!! (Sure does wear you out!) :) Unfortunately, we didn't see ANY moose - not one throughout our whole trip, which was disappointing, but everything else made up for it. Before I continue on into a book :), I'm gonna go - but you really will have the most wonderful time here! Take a trip to Bar Harbor, an absolutely BEAUTIFUL town only about two hours away. Be careful on the rocks while tubing - you may catch a few bruises! ** (More than I bargained for, but well worth it!!!) Enjoy! * Inner tubes and life vests are not provided by Big Wilson Camp. Those described above were left by another guest. We cannot assume liability for their use, or assure they will remain available for future use. The owners recommend you bring your own tubes and vests, or purchase them at Indian Hill Trading Post in Greenville. ** A good warning about tubing on Big Wilson! When the water is lower, the rocks can be obstacles to watch out for, and when the water's high, the ride can get very rough in places. See other notes about tubing (below). It's one of the funnest things to do on the river, and we highly recommend it, but there are dangers to keep in mind. Note that the owners of Big Wilson Camp own only to the high water mark of the river and all activities on the rocks and in the water are at your own risk. Had a great time on the Katahdin cruise around Moosehead Lake. Went to the Black Frog for an excellent dinner. Took moose safari with the Birches and saw zero moose. We heard after that that Northwoods Outfitters were much better on moose safaris. We hiked Borestone Mountain on September 2, my Birthday (Bill). Wow, was it a great view up top. You must go to the other end of the mountain top while you are up there. It's worth it! The climb was difficult compared to Connecticut hiking, but it was the most magnificent views we ever saw. By the way, even though we saw zero moose on the safari, we saw 11 moose on our own, six deer, one red racoon, King Fisher birds, along with Blue Heron and Loon. By the way, if you ever strike out on moose, you will always find one when it starts to get dark, and through the night, on Route 15 North, towards Moosehead Lake at the D.O.T. building on the left. Just drive in and stay left, and point headlights back toward Route 15 over the mud pond. They should be there. We've had a great time at Big Wilson Camp. We went in the river, up to Little Wilson Falls, and Onawa Lake. We'd tried to dam the river, but it was a little too big for us. We drove to Bangor and Bar Harbor, had fun at Seal Harbor. This morning, we saw a red fox by the cabin and are leaving now for our return journey to Long Island. After traveling from CT, we arrived on Saturday evening to find the cabin very cozy. We spent a very busy week fishing, canoeing and kayaking. We found Prong Pond very useful for all three activities. The small mouth bass were biting! Beware, Prong Pond is bigger than your average pond! We did see about four moose total on the road to Greenville, but not all of us got to see them. If you want to go on the moose tours hosted by Northwoods Outfitters, then make your reservations now because we missed out. The boys of our group advise that there is good trout fly fishing in the Kennebec River. We brought up tire tubes and had a great time in the river/falls. To jump off the cliff into the swimming hole is a bit shallow at this moment, but still fun if you have a buddy down below telling you where the rocks are. We had a wonderful time. Thank you for sharing. * Thank-you Boothroyd family on behalf of our other guests. For those planning on tubing, Big Wilson is navigable by inner tube (water level permitting) all the way down to Willimantic (seven miles downstream), but watch out for the dual dropoffs at Tobey Falls, just north of the Willimantic bridge. Depending on the volume of water over those falls, they can be very dangerous. I am a former college swim team captain and marathon swimmer, and I would not risk my life riding that stretch of the river. There are paths you can portage around those falls. Also, for your safety, never swim or ride the tubes alone! We arrived Saturday evening after being married in the L.D.S. temple in Boston, MA. Our honeymoon here in the Big Wilson Camp was great. What can I say ... We had a great time. On our few outings, we rode the Katahdin steam boat, hiked to Little Wilson lower & upper falls (we got lost numerous times), went to Tobey Falls, and swam in Big Wilson Falls. We loved the fire pit & deck. Thanks for a wonderful & memorable stay. We arrived on Saturday afternoon and now can't believe where the time has gone. We spent many days down on the water, tubing, jumping from the rock & playing a ton of games. We took a hike up Little Wilson Falls & the views were awesome. We really enjoyed our family time. The camp was great & people here are very friendly. Everyone who comes please enjoy. It really is nice. Hello from the Plasse family from Lyman, Maine. Saturday/Sunday - Arrived to find a beautiful camp on a beautiful piece of land. Thank you to the owners! Hiked to Little Wilson Falls & gorge, then took much-needed naps! Campfire & S'mores. Saw two fox. Tuesday - Hiked up Borestone. AWESOME !! Wear good sneakers or hiking shoes ... The views are breathtaking. Wednesday - Trip to Lily Bay State Park. We had camped there 30 years ago and it is just the same. Did more fishing and caught nothing. Came back here to swim in the stream. Campfire! Thursday - Played cards. Relaxed. Cooked. Played tennis in Abbot village. Had a wonderful week for a much-needed family vacation. Thank you. Blessings! This is our last night at Big Wilson Camp and we are packing up to head home to Ohio in the morning, but not without a last dip in the swimming hole before we go! We have had a great week! Thank you to the owners for sharing this lovely cabin, and the awesome surroundings. We really enjoyed the picnic area, sitting around the campfire & re-living our day in conversation. So much to do and not enough time! Everywhere we've gone, people have been so helpful and kind. Thanks again! We've had a wonderful time! We had a GREAT time here. The first night, we were out front of the camp and a moose walked right by on Elliotsville Road. My girls were in shock. The camp is wonderful. The kids (8,6 & 6) loved the loft with their own TV. They never complained once that they were bored. Borestone mountain was awesome. The views were a once-in-a-lifetime thing. We loved wearing goggles in the falls and watching little fish. The upper falls was a big hit, too. The shops in Greenville were great, too, and we took the trip on the Katahdin, also. The people here are all so genuine and nice. Thank you so much for a great family vacation. The cabin exceeded our expectations. Great place, great decor. Kids loved the loft. Jumping off the rock was really fun. Got some great pictures of the kids flying in mid-air. Took a hike to the top of Borestone Mountain. Some of the crew almost cra**ped their pants from fear on the way to the top. What a spectacular view! Had lunch on top and came back down. Great hike!! Did the moose safari out of Greenville. Awesome trip if you want to get up close and personal with the moose. We were about 10 feet away in a canoe while the moose were grazing in the water. Really cool! Spent remainder of the time playing in the stream and cooking out on the deck. This diary was a great source of information. We didn't have much of a plan, but after reading others' experiences, we filled our days fast. Great idea. Thanks for sharing. We kept losing track of the days, of time, and just enjoyed the days as they came. We loved the waterfalls, the mountain hikes and the lazy atmosphere. What a great place for families. Thanks for sharing. One of our highlights was scampering down the mountainside by Moxie Falls and swimming in its water. It was a bit slippery from all the rain we had, but once down there we had so much fun. We also enjoyed the quiet out by Lake Hebron. We sat and watched the sunset over the quiet and still lake. The only sound was a loon crying out. It was so lively. What a relaxing way to end the summer ... with good friends, good books, and an endless waterfall ... (and my 1st moose confrontation). Enjoyed having days of relaxation and days of seeing surrounding sites. Hope we can visit Big Wilson in the future. It is awesome. Hello! We had a wonderful time here and will return home with some great memories. We have three children (11, 8 & 5) and after a week with them we feel very re-connected! We spent a lot of time swimming in the stream and driving around the old logging roads. Evenings were spent down at the fire pit and playing games. The most memorable experience was hiking up Borestone Mountain. The views were unforgettable. We also hiked up to Little Wilson Falls, but the water was a little too cold for the rope swing! It was a great week and a wonderful camp. Hopefully, we'll be back soon! We are the Workman Family - Greg, Sandy, Aaron, and Brady from New Castle, PA - just north of Pittsburgh. Well, we found what we were looking for - and more! You have a very beautiful home and location and the area is full of natural wonders! God's creation is so overwhelming here! Thanks for helping to make our vacation full of some very wonderful memories! May God richly bless you. Sometimes the internet can be both a curse and a blessing. Breaking a 10-year-old (Jessica) and a 14-year-old (Michael) from it can be trying. But when you find a place like this online and it turns out to be better than displayed, you take the blessing. We did things families are meant to do. We kayak'd on Onawa and Prong Pond. Prong Pond provided fishing for me and swimming from the rocks for the others. We hiked to Wilson Falls and the top of Borestone Mountain, while light rain fell for the falls and heavy rain on the way back from Borestone. It got the exercise juices flowing on both trips. Went back to the "swing" and got quite a few pictures of our new events. We used the firepit and swam in the local sound machine (falls). After one fire, we took the kids out to the road and saw shooting stars and more stars than Jess knew existed. She was amazed that the sky could hold that many. The first moose was spotted at the marsh on the way back from Greenville. Friday, on the way to a moose safari, we saw momma moose with a calf. The safari yielded five more moose, for a total of nine for the week. The river otters on the trip were a bonus. One morning a fox was out in the driveway and then while playing in the pool below I had a bird land on my head. It was recorded by mom to show my nest-like hair. Most nights ended with games and reading - something I rarely find time for. Thanks for the refreshing week - worth every mile you drive. We are the Smith family - Joy, Edward, Sarah (18), Rebecca (16) and Alan (11), all the way from Ireland. It was a long trip over, but it was well worth it. We thought the accommodation was excellent - it suited everyone perfectly. We have had a wonderful time here at Big Wilson Camp. We jumped into the swimming hole and tubed down the river many times. We also spent a couple of nights down by the fire ring, making S'mores. Some evenings, we relaxed in the house, watching movies and playing Cranium - which was loved by all and is now on the shopping list. We climbed Borestone Mountain and loved the sight - it was well worth the climb, although we got soaked on the way back down! We had a brilliant day whitewater rafting on the Kennebec - thoroughly enjoyed by all. We would definitely recommend it. We also got up early one morning, went to Auntie M's for breakfast, and then went on a moose safari. We got to get up really close to a feeding moose. It was amazing! We had the most awesome time here. We swam, hiked to Borestone Mountain, tubed down the river, walked to the upper falls, enjoyed some time in town (Greenville) and made many wonderful memories. Some of our nightly games included "Food Fear Factor", card games like "Up and Down the River", talent shows, and of course, watching our "TV" ... the bug zapper. We enjoyed the scavenger hunt - the items our parents came up with was very creative. I am sure we will be back next summer. We had an amazing time! It's fun to play at Camp Wilson, Ya! It's so much fun at Camp Wilson! What a "hidden treasure" this place is ... tucked away in the North Woods of Maine. The sights, the sounds - as the water pounds ... Returning to New York is truly insane !! Our stay was short, but we look forward to returning! Being separated from the world for awhile was "heavenly". (I will miss the wonderful sound of the water.) Everything about the place was great. We love the creature comforts, the beds were great and we slept so well. Next time I must do the campfire and indulge in S'mores!! We wish you great blessings to your whole family and all your guests that will enjoy this little bit of heaven! We had a wonderful time at Big Wilson Camp! Although we only had a couple of days, we managed to hike Little Wilson (Upper) Falls and Borestone Mountain Sanctuary. The beauty and seclusion were amazing! We had a wonderful dinner with dear friends and a very competitive game of Monopoly. I don't think we have slept as well in a really long time, with the sound of the river keeping us lulled to sleep. The cabin exceeded all expectations. Now this is enjoying the great outdoors in style! This is a beautiful area. We're from the Chicago area. This is our fourth New England state in four years for the fall colors. Maine wins - so far! We did the Borestone Mountain hike - terrific - and Little Wilson Falls. Your home is beautiful. Thanks for sharing. We really enjoyed the fire pit and the falls. We had a great time at the "Stressfree" Moose. Very nice people and good food. If anyone is into geocaching; we were able to find a few great finds and see some interesting things in the forest. We saw one moose on our way in and a few fox nearby. A deer walked up to say "hi" one morning. Thanks again for sharing the area. Is there a way to take the bunk off of the bed in the second bedroom? It was kind of uncomfortable sleeping for a couple. But we would definitely come back if we could. We had a wonderful, relaxing vacation! The camp is so beautiful, you felt so welcomed and the decor made you feel as if you were surrounded by wildlife and the great outdoors. Everything was wonderful and perfect. I spent many hours just sitting on the rocks or a chair near the water, reading or just enjoying God's masterpieces. everywhere. A pair of Pileated Woodpeckers flew in front of us while on the deck and we watched them flying around the trees. A new bird to add to our list. One evening on the way home, we saw a doe right around the corner from the camp. Spent a few evenings around the campfire. Got to cook hot dogs and marshmallows. We did a lot of exploring on the logging roads. Saw many beautiful places where moose should be, but I guess they were all sleeping or hiding. Hiking up Borestone Mountain was great and the scenery awesome. Added another Turkey Vulture to our list. Spent an afternoon on the moose safaries and scenic cruise, from the Birches. The trip was well worth it. It shows how beautiful Maine's lakes are. It was unusual, but we didn't see any moose. We had a great meal afterwards at the Birches. Hiked to Moxie Falls. We took so many pictures it was well worth the stop. It was so great to look up at the stars each evening and see how many you could pick out. We had a wonderful time and hope to come back! Thank you! Wow! We've had such a fabulous time. It started the moment we walked through the door of Big Wilson Camp. We were stunned by how beautiful the place is. Excellent decor and a magnificent location. We felt at home right away. We enjoyed a few days of just lounging around this amazing camp. When we ventured out, we did some hiking nearby. We also went on a cruise around Moosehead Lake on the Katahdin. The highlight of the week was a moose safari we took that was offered by Northwoods Outfitters. We drove an hour out of Greenville and spent two hours paddling around a remote pond. We saw seven moose that evening! We were able to paddle right up to them. Our guide, Chris, was very friendly and informative. We'd definitely recommend this trip. And, yes, inspired by the Kells from York, PA, we also watched "Footloose". Riveting. This is our fourth year vacationing in Maine, and Big Wilson Camp is our favorite spot so far! We were pleasantly surprised by the accommodations provided. We found that many of the "normal supplies" are already provided here that we normally drag along every year. Much of our week was spent on our favoite pond, Prong Pond. We spent a great deal of time canoeing, fishing and diving from the rocks. We were not lucky enough to see the twin moose on the pond, but over the course of our travels we came upon two female moose along the roads. A new adventure this year was to hike the trail to the top of Borestone Mountain. What a rewarding sight to take in at the summits. We recommend the hike as a rewarding adventure! One of the huge hits of the week, besides the falls and the fire ring, was the VHS movie "Foot Loose"! Our four teenagers spent many hours watching and rewatching the movie to the point of memorization. They all now are considering buying the soundtrack from the movie when we return home. Who would have thought? Thanks for providing such a great place to vacation. As we pack to return home, our thoughts turn to what new adventures we will encounter next year. This is my first adventure in northern Maine and I'm sure it won't be my last. Everything is so wonderful here - sounds, scenery, companionship, lodging, and the food tastes so much better here. Your home is so beautiful, and furnished first class. The river is so beautiful and the sounds from it are so soothing. Being here gives you the chance to slow down and see and feel the wonders of some of God's greatest gifts. Thank you for sharing all these gifts with others. What a great way to wrap up the summer! We had a great time exploring around Borestone Mountain. We saw a pretty little fox watching us from the roadside. The day before, we had climbed the trail up Little Wilson Falls (saw several hikers, a fisherman and a Kingfisher bird). Our kids had lots of fun swinging into the water from the rope swing and jumping off the rock ledge closer to the cabin. A family flock of Hooded Merangers came by. One afternoon, the girls all headed into the village around Moosehead Lake for shopping and ice cream - yum!! My favorite thing of all (beside spending quality, TV-free time with my extended family), was listening to the rushing river and falls each night. We'll be back!! We are a family of a dad and mom, a 12- and a 10-year-old boy, a girl of six and a grandmother. All three generations really enjoyed the cabin. The bedrooms are very attractive and comfortable. We enjoyed the excellent kitchen as well as the grill on the porch. The river is a wonderful spot for all. Some swam, some just enjoyed its beauty. The dad especially liked finding a place to dive as well as a place to snorkel and explore. The mom's favorite was climbing nearby Borestone Mountain with the 12-year-old (her favorite day, too, and the dad's). Dad's comment was that it is the best summit he has ever reached - the 360 degree view being extraordinary. The 10-year-old had the most fun jumping from the cliff on a rope into the pool below at a nearby area (the lower falls of Little Wilson Stream). His six-year-old sister loved swimming and splashing in the pool. Nana's favorite time was a three-hour cruise on the restored steamship Katahdin on Moosehead Lake in nearby Greenville. Altogether a very successful vacation! After a whirlwind decorating expedition at Easter-time ('04), our new cabin's interior is ready to surprise and delight our first summer guests. We were hard-pressed to do justice to the natural beauty of the waterfalls outside. There is no competing with Mother Nature, after all. But we don't think anybody will be disappointed with the care and attention to detail we have given the interior, either. Have a peek at our new pictures at the bigwilsoncamp web site. Although pictures of the interior of Big Wilson Camp are not available as of this writing, we're having a ball picking out great stuff with which to furnish our vacation getaway cabin. By Easter of '04, we'll have the place outfitted as a rustic North Woods retreat, but with plenty of modern amenities to make it a comfortable escape from civilization. The river has a tendency to change dispositions from season-to-season and day-to-day, depending upon recent weather conditions. As you can see from my thumbnail photos on the bigwilsoncamp website, the stream varies from tranquil and idyllic to a kayaker's playground. Even when the river's at its highest or lowest, the swimming hole slowly swirls on the far side. When the water level is high, you may want to traverse the water over the bridge on the north end of the property, or ford the stream below the rapids, rather than try to cross in front of the cabin. One of my favorite things to do nearby is walk or drive (less than a mile) to the lower falls on Little Wilson Stream. There's a rope swing and deep pool there, below a beautiful cataract. The water is a little chillier there, because it's a spring-fed tributary, whereas Big Wilson gets most of her waters seven miles upstream from Lower Wilson Pond. I hope it's apparent how in love with the place I am. I found it about 10 years ago, and like fine art, it's a shame not to share something of such beauty. When I started building my website to rent the place, I was astonished how many past visiters to Big Wilson Stream had been struck by it enough to photograph "my" little stretch of stream and post their photos to the internet. One of those I stumbled across was by professional photographer Charlie Morey, whose work graces galleries across the country - as well as a prominent place on my hearth.